Hello, in this article we want to discuss dog tongue, one of the familiar organ of our furry friend. After a few research, it really amazed me how important this organ is in the life of our fuzzy companion. 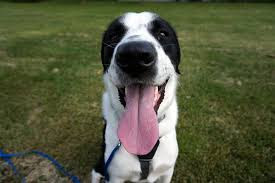 Almost everybody is familiar with a dog tongue, whether seeing it hanging out on a hot summer or being used vigorously licking the owner in a greeting. This organ sure plays an important role in dog's life and that of it owners. Dog tongue is one vital organ of its body. Unlike in people where the tongue is normally used for sensing taste and eating food. A dog tongue is used to carry out numerous body functions. Dogs use their tongue to taste and lick up both water and food, the dog also uses its tongue to licks its wounds or injuries for healing; this is because the saliva is known to contain some beneficial compound capable of destroying the cell wall of gram-positive bacteria. For dogs, the tongue also serves as a natural tool for grooming. Additionally, it helps in smells, when dogs sniff something interesting, they are primarily gathering the scents molecules, with the help of the tongue they will be able to send them to the incisive papilla a behavior called to as tonguing. These scent molecules then get to the dog Vomeronasal organ and finally the brain will obtain a behavior response like marking over a sniff area. With the exception of the above-stated functions, another major essential function of dog tongue is for cooling of the body. After a session of a thorough physical exercise as the dog begins panting the tongue function as a natural heat regulator. The short warm breaths of the dog wet the surface of the tongue. As the lengthy tongue gets laid out of the dog mouth the moisture vaporizes and cools down its body. As you can see how vital this organ is to your Fido, ensure you take proper care of your dog tongue. Though quite uncommon, in case it gets injured you are recommended to take your dog to a veterinary for a check.